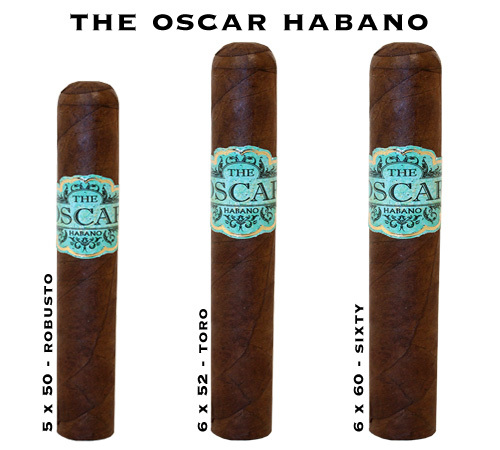 Oscar Habano Cigars - Buy Premium Cigars Online From 2 Guys Cigars . We first came across The Oscar Habano in a non-tradional way. Some of our staff here at Two Guys Smoke Shop, specifically Barry, Derek, Mr. Jonathan and Dave are members of the Cigar Journal magazine tasting panel. Each month they get about a dozen cigars with a number on the band. They don't know what the cigar is until after the reviews are submited. After they smoked The Oscar Habano they all gave it a score in the mid-90's. Pretty unheard of since they like different smokes and different strength profiles, but they were in agreement. We had to get these cigars! Packaged in 11 count boxes that look just like a mold used in the cigar factory to give the hand rolled cigars their shape, the presentation is simply stunning. Instead of being wrapped in cello they are covered in a candela tobacco leaf, that you remove before lighting the cigar underneath. It features a gorgeous chestnut colored Ecuador Habano wraper, over a binder from Honduras and filler tobaccos from that nation as well Nicaragua. The smooth and complex notes of The Oscar will have you coming back time and time again. It's so good, their should be an award named after the cigar.